A dreadfully seductive beauty has emerged from the depths. She begins by humorously entertaining her victims and leaves them with an insatiable urge to believe in her awful abilities. This bride is dangerous. She is MENTALISM! Docc Hilford is the crazed creator of the renowned Cassandra Deck, author of over 30 books on mentalism and consultant for a dozen television shows. He's joined by professional mentalist David Alexander to discuss the psychology behind each piece. 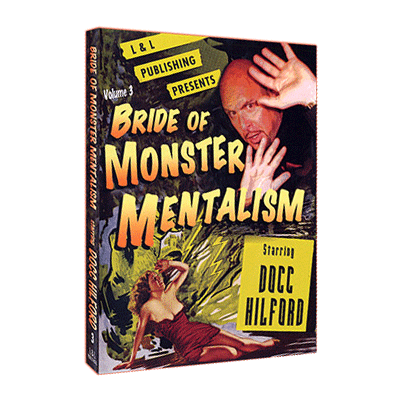 Monster Mentalism is an astonishing collection of useable effects and the diabolical methods that have made Docc Hilford infamous. A Letter from the Future - A mysterious man risks everything to travel forward in time, gain information and prove he's returned to the past. But will he live long enough to see his proof discovered? An interactive production that will draw you into every choice that either proves or disproves it's not just science fiction. Tridiction - When David was thrown out of a Tahoe casino, he vowed revenge. A Satanic pact gives him a weird power, enabling him to predict the outcome of dice, poker and 21! Now they would pay, but what would be the price to David's soul? WARNING: This technique is described for entertainment purposes only! Self Help - When evil genius Harry Lorayne created a nightmare in his basement, he never dreamed that its chains would be broken and the little terror re-trained to rip the eyes out of innocent tradeshow attendees. But that's what happened. Come see the beast . . . if you dare. Projected Force - A subject was psycholo­gically MADE to think of a playing card without any being present. NOTICE: This is the original method that became a famous UK mentalist's favorite. Peek Book - Without a single book in view, another subject was instructed to merely think of a word. She never wrote it down, yet unconsciously made it evident to the experimenter. An apparent "bookless-booktest." ESPed - A subject was finally instructed to draw any picture he imagined on an index card. This experiment was conducted across the room and the experimenter never touched the card, yet he still had total knowledge of the design. Now the experimenter becomes the experimented! The required props for this full routine are as bare as the skeletons buried behind the laboratory. It's shockingly direct! "This is the closest thing to real mind reading I've ever seen!"